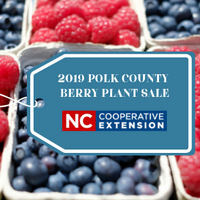 The Cooperative Extension of Polk County is hosting their annual berry plant sale. This year, the Cooperative Extension director has chosen four varieties of blueberries, two varieties of raspberries, two varieties of strawberries, and one blackberry variety that have proven to specifically thrive in the North Carolina Foothills. Orders will be accepted for plants now through February 22 and will be available for pickup in mid-March. Proceeds from this fundraiser go to support the activities, classes, and research that make the Cooperative Extension such a vital part of the Polk County community. For more information or to place an order, visit the Extension’s website at Polk County Berry Sale or give them a call at 894-8218.